The United States Department of Energy’s Office of Biological and Environmental Research has compiled this prodigious image gallery from a wide range of scientific research projects. The materials here come from the Environmental Molecular Sciences Laboratory, the Human Genome Project, and the Microbial Genomics initiative. Visitors can make their way through galleries that include Genomic Science Image Gallery, Climate Science Image Gallery, and Human Genome Project (1990-2003) Gallery. First-time visitors might do well to look over the images from the Human Genome Project first, as they will find colorful and interesting visual documentation of this ambitious project, along with slides and other materials that can be used in classroom settings. 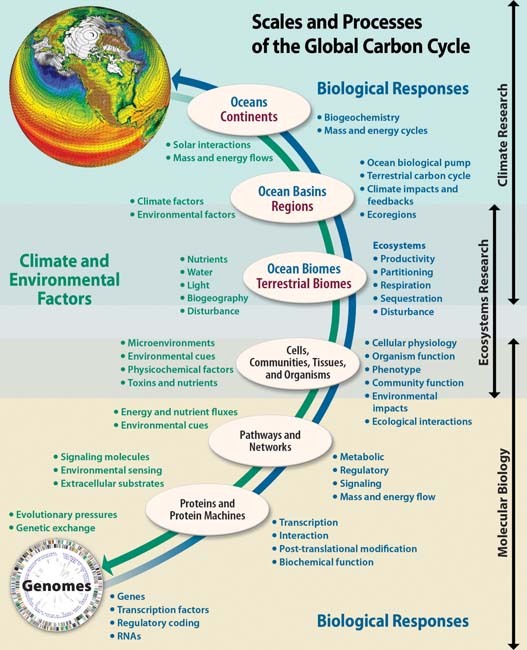 Moving along, the Climate Science Image Gallery contains a nice range of images related to atmosphere science, including a great graphic that illustrates atmospheric processes and global carbon cycle components. To find more high-quality online resources in math and science, visit Scout’s sister site: AMSER, the Applied Math and Science Educational Repository at http://amser.org. This entry was posted in Bioenergy, Biology, Energy, Government, Images, Photos, Uncategorized. Bookmark the permalink.